Jonathan Olch is the author of the comprehensive and highly acclaimed new book A Passion For Permit. You can learn about the book on Jon's website: JonOlch.com or at Wild River Press. Over a thirty-year period Jonathan has hooked or caught hundreds of Atlantic permit, along with several other prized Trachinotus species, in such oases as Belize, Florida, Cuba, the Bahamas, Mexico, Honduras, Seychelles, Australia, Oman, Turks & Caicos and Venezuela. 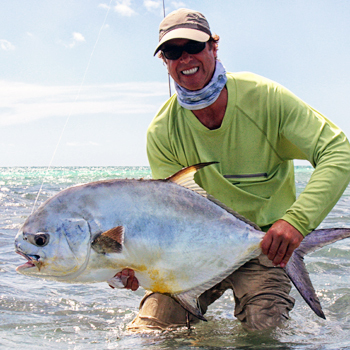 Olch is the holder of the current IGFA 20-pound tippet class world-record Atlantic permit, a fish caught and released on the flats of Key West. Jon Olch has been fascinated with fishing the saltwater flats for almost 40 years. He’s caught just about every kind of fish on the flats but he’s obsessed with permit. He’s studied the permit inside and out and is one of the most knowledgeable permit fly fishers on the planet. Join us to learn more about fly fishing for one of the most challenging fish in the water. As a freelance writer, Jonathan’s articles have previously appeared in such publications as Fly Fisherman, Fly Rod & Reel, Salt Water Sportsman, TAIL Magazine, Fly Tyer, The Angling Report, The Orvis News, Flyfishing, and The Flyfisher. An innovative fly tier, Olch became one of Umpqua Feather Merchants original contract fly tiers in 1983. His fly pattern designs have appeared in a number of fly tying books over the years including: Salt Water Fly Patterns (Kreh), Bonefishing With A Fly (Kaufmann), Saltwater Flies (Meyer), Fly Tyer Pattern Bible (Surette), Perrault’s Standard Dictionary of Fishing Flies, Fly Patterns of Umpqua Feather Merchants (Kaufmann). Jonathan grew up in New England where he learned to ski and explore the trout streams of New Hampshire. Moving west, he competed briefly as a ski racer for the University of Colorado and later on western regional professional tours. Physical issues plagued him, so he turned his need for speed to auto racing, where he raced professionally for seven years in multiple IMSA-sanctioned sports car series, highlighted, perhaps, by a top finish at the 24 Hours of Daytona. Around that time, Jonathan immersed himself in the real estate brokerage and development business around Park City, Utah, allowing him to pursue his passion for saltwater flats fishing with a vengeance. For vast chunks of the past decade, Jonathan has obsessively chased permit with a fly rod and camera while based aboard his personal catamaran, primarily in Belize, Honduras and Florida. Now, in his latest quest, he has redirected his catamaran to explore for permit in obscure and remote parts of the Caribbean. When not hunting the flats, Olch enjoys flying his Cessna 206 around the western states dropping in on obscure trout and steelhead haunts. Jonathan makes his home in the mountains outside of Park City, Utah.